At this point, everyone should notice a pattern in the descriptions of those greyhounds that get lost. The first word I always see is 'shy'. In the case of Tangerine, who is currently lost, 'wary of strangers' fills the bill, 'do not chase' fills the bill, 'spooky' fills the bill. Now anyone that has a dog that also fits this criteria should be aggressively trying to remediate the root of the problem. 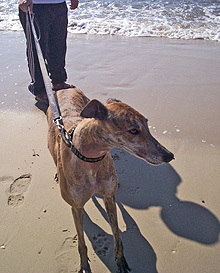 After adopting greyhounds for the past 20 years and being the leading proponent of thyroid supplementation for at least 15 of those 20 years, it is my very firm belief that most greyhounds that have low esteem, i.e., shy, spooky, wary of strangers - do not chase, fall into the category of dogs that would benefit from thyroid supplement. Thyroid supplement has very little to do with whether or not your greyhound tests as being hypothyroid. Most greyhounds will typically test hypothyroid but only some of them, whether the greyhound tests hypothyroid or not, have these low esteem issues. Thyroid tests are very important in the beginning, not to determine if they are hypothyroid, but solely to determine what their base level is so that it can be used for comparison purposes in the event they need to be medicated. At NGAP, we medicate with Soloxine .6, .7, and .8mg. Soloxine is the brand. We only use the brand. Thoroxine is the generic and does not work as well. Don't use it. For the most part, with very rare exception, (I only know of one in 20 years), would lower doses be appropriate. I was recently told that one of our greyhounds had significant benefits while on Soloxine .2mg and when they raised it to .3mg, the greyhound became hyperthyroid. The dose was then changed back to .2mg. Most greyhounds need significantly higher doses if you want it to have any impact on your greyhound. Now, let's just say you have started your greyhound on Soloxine .6, .7 or .8 and although you see some improvement, not as much as you would like, and the dog still exhibits some of the same symptoms but not nearly as severe. It is then probably appropriate to do another T4 test making sure your vet draws the blood five hours after the thyroid supplementation is given. That 5 hour period is very critical so that the results do not become skewed. I hate to be redundant, but after 20 years I have learned that greyhounds are at their best when their T4 levels are between 3.5 and 4.5. Yes, the 4.5 is a little above the normal level, but as long as your dog does not show symptoms of becoming hyperthyroid, it does just fine. After so many years of medicating greyhounds with Soloxine, we have seen no adverse effects from lifetime use and, yes, the dog will most likely be on it for the rest of its life. Some vets may disagree with this philosophy because they didn't learn it while attending university they graduated from, but they don't see 2000 to 3000 greyhounds a year in clinic or house 50 to 100 greyhounds year round. Their experience, by comparison, is significantly marred. It has been suggested over the years that we do clinical studies and if I have said it once I have said it many times, it is not our job to perform clinical studies here. We treat dogs that are symptomatic and most show significant benefits. I have had some of my own personal dogs on Soloxine for many years. I would not bring a greyhound into my home that was not happy with its life. I would not want to run the risk of my greyhound running away and having an amber alert saying 'shy', 'wary of strangers' or 'do not chase'. Too often, the conclusions are dismal.